The party cup of joy was brimming over, leader after leader hailing them for the stunning victory in Uttar Pradesh. As the results came in Saturday, Prime Minister Narendra Modi and BJP president Amit Shah had brief conversations over phone. The party cup of joy was brimming over, leader after leader hailing them for the stunning victory in Uttar Pradesh. Modi and Shah did not say much. They thanked the voters, especially the poor and the youth, and let the scoreboard do the talking. A party source said the next project on Shah’s table centres on 120 Lok Sabha seats where the BJP has little or no presence. That’s his next target, the source said. The BJP chief plans to tour these 120 constituencies, mostly in the South and East, and start from scratch by building the booth-level infrastructure. 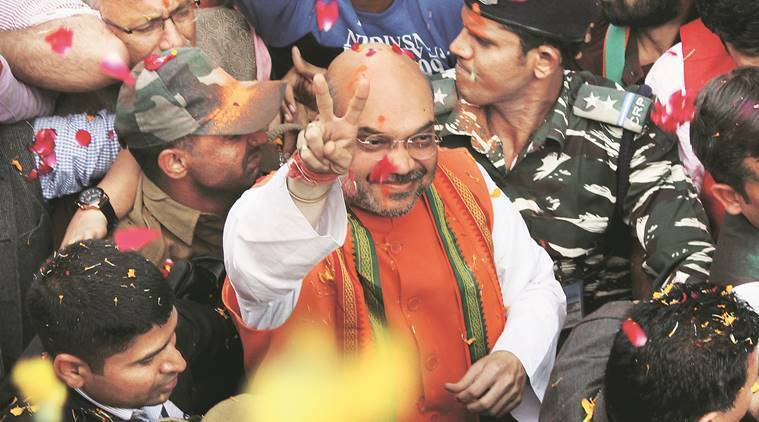 “Shah wants these 120 seats under the Modi umbrella,” the source said. These constituencies are spread across Kerala, Tamil Nadu, Orissa, Andhra Pradesh, Telangana, West Bengal and states in the North-East.